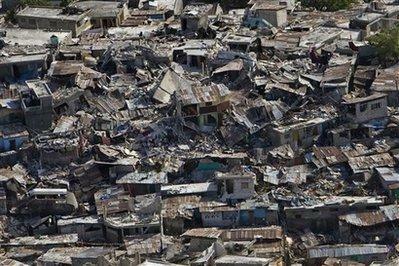 On January 12, 2010 a major quake hit the capitol of Haiti, causing widespread devastation. The magnitude 7 quake was followed by 32 aftershocks between magnitude 4-6 within 10 hours after the initial jolt. A major earthquake hit the impoverished country of Haiti, collapsing buildings in the capital Port-au-Prince and burying residents under rubble. The epicenter of the quake was located inland, only 10 miles from the capital Port-au-Prince and was very shallow at a depth of only 6.2 miles. Haiti of course lies on a fault line, along the edge of the Caribbean Plate. Per the Zetas, Haiti will not fare well during the forthcoming pole shift, nor in the interim time between then and now, for many reasons. 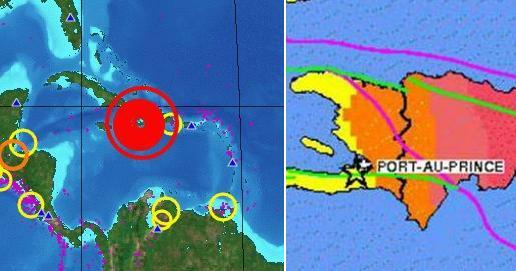 They have predicted the islands in the Caribbean will crumble during the pole shift, caught in the crunch between the massive S American and N American plates. ZetaTalk Prediction 2001: The islands in the Caribbean will be utterly devastated during the coming shift, hit from several sides. When the Americas move into the Pacific, shortening the distance around the Pacific Rim and widening the Atlantic, the giant continents of North and South America will not simply drift evenhandedly westward. Moving plates move in the direction of least resistance, which in this case is toward the middle of the Pacific hole. Central America loses in this crunch, as do the smaller plates supporting the Caribbean islands. Any island surviving this crush, where smaller plates will subduct under larger giants, will have to deal with tidal waves washing over them and exploding volcanoes. Going to sea in boats will scarcely be an answer, as the turmoil the water will be undergoing will create vortexes that will capsize large and small boats, and even dash well built submarines in deep water. Surviving in the Caribbean, during this violent shift, will be the exception, and will require luck, not planning. I, Nancy, attended a group presentation, done by a very interesting alien woman last November. One of the issues warned about was rolling of the S American Plate, where the top bulbous part of the plate is pulled toward the Pacific while the tip remains nailed to the Antarctic Plate. I noticed that during the time of the Haiti quake, numerous small quakes were occurring all along the S American Plate edges. This plate rolled, and Haiti was affected! Below, my recall of this presentation. Nancy is in front of an alien with huge green eyes, which are together as large as her face. She has some kind of tentacles hanging down from her mouth, from the sides of her mouth, but these are only a couple inches long. She is helped out of a tub of water, nutrient water, and it becomes apparent that where she has thin arms and legs that her middle is beset with more tentacles, these a foot or more long. This gives her a pot bellied appearance. Her rear legs come to a small foot, almost like a hoof, and bend at the knee like a horse or dog's back legs do, not like a hominoid legs. Yet her arms have hands and digits. Her assistants come with a sleeveless smock, bright colors of yellow and orange, and tie this behind her. This is to cover her belly of tentacles. She and Nancy walk out onto a stage, hand in hand, but the alien moves to take a seat on the stage while Nancy steps down into the crowd, helped by a man who extends his hand to steady Nancy. The alien gives an overview, telepathically and via a holograph, to the crowd. The Mediterranean is shown, while Africa rolls somewhat. This opens up the southern Mediterranean above Algeria such that the Mediterranean floor there is a crumble, not supported. Then over to India where the western side of India sinks significantly, the plate tipping sideways a bit, raising eastern India during this process. Then islands in Indonesia sink, the plate supporting them sinking more than the surrounding area. Over to S America the Andes are shown doing mountain building, while some islands in the Caribbean are sinking, their plate pushed under as S America rolls. Southeastern US is pulled down slightly, while the land just to the west of the Mississippi drops slightly. As the Atlantic rips open, this causes water adjustments. First water rushes from elsewhere to fill the void, then piles up, clashing in the middle, so that a tide rushes toward Europe, assaulting the lowlands there. Nancy later goes to thank the alien woman, holding her hand during this, and is told by her aids that she must be returned to her water tub or such absences shorten her life. As with the New Orleans disaster following Katrina, Haiti presents a picture of what will occur as major disasters deplete the world's ability to respond to disasters, or are simply unable to respond at all due to worldwide devastation happening all at once. Haiti is being rescued, where the pole shift will bring lack of rescue. The message here is to be out of the cities, into rural areas where families can be self sustaining. The message here is to be out of large buildings that can fall and crush one. The message is to not anticipate rescue, but to be prepared to rescue oneself. Survivors of the earthquake in Haiti that may have killed as many as 100,000 people face deadly outbreaks of diarrhea, measles and malaria after its already fragile clean water and health-care systems were destroyed. Diarrheal diseases, including cholera and e. coli, cause severe dehydration and strip the body of needed nutrients. Diarrhea will flourish as survivors struggle to find clean water and safe food. The chance of survival plummets for someone buried under rubble after 48 to 72 hours. When those with more serious injuries are being treated, people with broken bones and other more moderate ones can get infections while they wait. There are also shortages of things like gasoline, which affects the working of all kinds of vital equipment. There's going to be a secondary wave of people migrating from Port-au-Prince to the towns. They'll come up to live with relatives and they won't have housing or food. So people who don't have enough food to begin with will have to split their food. Despair, anger, and the inevitable looting follow. Sporadic gunshots were heard, and witnesses said there had already been some looting in a city that has seen bloodshed and violence over the past decades. More than 48 hours after the quake, Haitians were still digging by hand through mountains of concrete and rubble while the screams and moans of those buried below rang out. Some people had set up temporary shelters with sheets and covers in a public square, while others were trekking out carrying meagre belongings, searching for safer places outside the city. There is a great sense of urgency in trying to get aid to those in need in Haiti, as more than death is feared. Lawlessness, in the absence of government control, is feared. The Haitian government is inadequate, in a similar manner to what will occur after the pole shift or the major disasters that will begin to afflict the world going into the last weeks before the pole shift. Haiti has a history of violence, with death squads bearing machetes. Per the Zetas, confrontations between the good hearted, who will be working to sustain themselves and to help others do the same, will occur with those who want to live by looting. ZetaTalk Prediction 7/3/2004: Eventually, survivor groups that remain are hard at work, all growing or catching their food and cooperating heavily with each other. The occasional lone thug is encountered and either runs for his life to live in the woods on his own, with survival very iffy, or is killed attempting to loot the hard working group. A group that is keeping starvation at bay by intense cooperation and careful planning recognizes instantly those that are doing likewise, and also recognizes instantly a group that has survived by looting. There are a thousand clues. Since the looters are increasingly finding themselves without and turning on each other, they are themselves malnourished, poorly coordinated and weakened, and blinded by rage over not having what they want, when they want it. In a battle with survivor groups that look out for each other, the thugs are easily picked off, and decimated further. In today's world, such vigilante justice brings harsh penalties, imprisonment, due to laws designed to keep the thugs off the streets but also due to the fear among those in control that their slave class, the working class, might rebel. But after the shift, with police and the military absent, phones dead, and determination of who the criminal and the victim are clear, standing back and letting the criminal have his way is not the option that is taken. Imagine trials where the victims of crimes determine the sentence, and you see the future of Service-to-Self gangs looting survivor groups. The History Channel featured what it called Armageddon Week during the first week of January, featuring such shows as: Doomsday 2012, Apocalypse Island, Nostradamus 2012, The Other Nostradamus, The Bible Code II: Apocalypse and Beyond, After Armageddon, Life After People: Wrath of God, Life After People: Bodies Left, Nostradamus Effect: The Apocalypse Code, Apocalypse Man, Nostradamus Effect: 2012 Extinction, Nostradamus Effect: Secrets of the Seven Seals, Mayan Doomsday Prophecy, Earth 2100, Siberian Apocalypse, Seven Signs of the Apocalypse. The Zetas were asked about this barrage of attention, given the current cover-up over the presence of Planet X. Question: Armageddon Week on the history channel is pretty edgy in terms of its message and content re a "pole shift magnitude disaster". Obviously the pole shift was not called out but fairly dramatic content was presented. Is this type of show effective in making people aware? And how do those that put these shows on avoid the wrath of TPTB that still want all possibility of a shift like disaster hidden from the common man? ZetaTalk Response 1/2/2010: History Channel need not fear reprisals from the Obama administration, which is encouraging more open discussion on these types of possibilities. Under Bush, there was a lot of repression and pointed national security directives, which were withdrawn when Obama took office. There is a type of test being done, wherein public reaction is gauged, and then the program reset to be more pointed or less, depending upon reaction. There are people who listen in during café and bar conversations, and others who monitor email for key words to find those email discussing the show. They are learning what we have stated, that the common man is not the element that will panic. It is those in control, the establishment, who panic because they fear being called to account on their lies, and fear the common man making demands upon them. Under pressure from the N Pole of Planet X, the magnetosphere of Earth is bowing, pushing the magnetic N Pole toward Siberia. Earth's north magnetic pole is racing toward Russia at almost 40 miles (64 kilometers) a year due to magnetic changes in the planet's core. The core is too deep for scientists to directly detect its magnetic field. But researchers can infer the field's movements by tracking how Earth's magnetic field has been changing at the surface and in space. ZetaTalk Prediction 7/1/2006: These are the primary consequences of clashing or merging magnetic fields, and the contortions that occur before they are merged or joined to the extent of causing the lean to the left and 3 days of darkness foretold. By this time the Earth will be in a severe wobble, caused by the daily tugging on the magnetic poles that present to the influence of Planet X - the wobble of today, exacerbated. In this regard, the steady approach of Planet X, coming ever closer so the influence of its magnetic field is ever stronger, does equate to more violent Earth changes. The Earth torque is one example, where the magnetic S Pole is tugged back each day, creating more stress on the plates in the Pacific and allowing the Atlantic to widen. The wobble is another such example, creating more erratic and violent weather, more storms, and more weather extremes. These will continue to increase, not because the fields are merging and clashing, but because Planet X continues to close the distance between itself and Earth, moving toward the hapless Earth during its passage, and thus the tugging on Earth will increase in its violence. What the clashing and merging fields does mean for Earth is that the Earth now has more than a torque and a wobble, it has a bully in the neighborhood that will eventually supplant the Sun's influence. Supplanting the Sun's magnetic dominance, combined with the increasing 270° roll that will place the N Pole of Planet X pointing directly at Earth, is what allows the pole shift drama to commence. A merged fields is natural for two planets forced close together, in such a setting. This merging of the fields has been occurring during 2009, with Earth losing its S Pole on occasion, and in the meantime, the magnetic N Pole of Earth is on the move! The Zetas have described the Moon Wwirls of Planet X as having the appearance of a string of pearls. ZetaTalk Description 6/15/1997: Planet X's moons travel like a string of pearls behind the monster traveling planet and a great deal of trash has also been caught, from boulders to gravel to dust that drags long behind as the giant comet's tail. Early harbingers of this trash have begun arriving.. These then showed up in late 2003 to early 2004 when the tail of Planet X wafted past the Earth as Planet X put on the brakes, slowing as it approached the Sun. The tail wafted past Planet X, toward Earth at that time. In 2001, when debates between the Zetas and astronomers on the sci.astro usenet were underway, I drew an image of what the Zetas were presenting to me of how these Moon Swirls would look from the side. ZetaTalk Description 2001: Having established a swirl behind the planet, the moons have two factors preventing a return to the normal orbital pattern of moons around a planet. First, their swirl perpetuates itself. The speed is dictated not only by the normal rotation around a gravitational master that attractants in the vicinity would create, it is dictated by the need to move away from the other moons in the swirl. Second, the larger moons in the cluster are perpetually trying to reach a closer proximity to their planet, the point where the repulsion force between the moon and its planet creates a stalemate. Being the larger moons, they push smaller moons away from their path, but this pushing action, in space, has the effect of causing them both to move, thus not only increasing and perpetuating their swirling motion, but also pushing the larger moon away from the planet it seeks to come closer to. Thus, the moons of Planet X, having assumed a swirl that perpetuates itself, remain in a dance behind Planet X even during its dither point between its two foci. Planet X moves, however slowly, at its dither point, so the swirl is always positioned between Planet X and the foci it is leaving. This swirl, unique to man in any comets or planets it observes, is what caused the ancients to call the passing monster, red in the sky because of its illuminated red dust cloud, a dragon, lashing its tail, the swirl of moons. Lately, the String of Pearls has shown up on SOHO images. The tail of Planet X is once again wafting close to Earth.